In December 1850, Tubman received a warning that her niece Kessiah was going to be sold (along with her two children, six-year-old James Alfred, and baby Araminta) in Cambridge, Maryland. Horrified at the prospect of having her family broken further apart, Tubman did something very few slaves ever did: she voluntarily returned to the land of her enslavement. She went to Baltimore, where her brother-in-law Tom Tubman hid her until the time of the sale. Kessiah's husband, a free black man named John Bowley, made the winning bid for his wife. Then, while he pretended to make arrangements to pay, Kessiah and her children absconded to a nearby safe house. When night fell, Bowley ferried the family on a log canoe sixty miles (one hundred kilometers) to Baltimore. They met up with Tubman, who brought the family safely to Philadelphia. 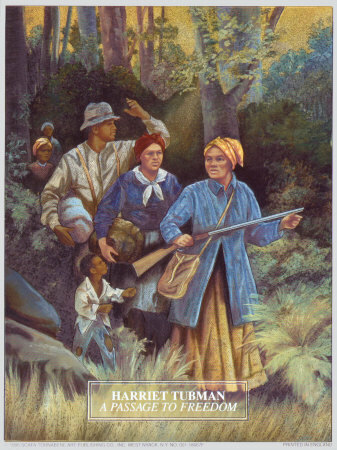 Harriet made the 90 mile trip to the Mason-Dixon line with the help of contacts along the Underground Railroad. She had to hike through swamps and woodland. Harriet's trip was successful, and she settled in Philadelphia. She worked as a dishwasher and made plans to rescue her family. The next year, Harriet traveled back to Maryland and rescued her sister's family. The U.S. Congress passed the Fugitive Slave Law of 1850, enabling law enforcement officials, even in states which had outlawed slavery, to aid in the capture of runaway slaves. Heavy fines and punishments were imposed on anyone who abetted the escape of runaway slaves.